For those living outside Scandinavia, the Viking Age effectively began in 793 with an attack on the monastery at Lindisfarne. The attack on Lindisfarne was a characteristically violent harbinger of what was in store for Britain and much of Europe from the Vikings for the next 300 years, until the final destruction of the heathen temple to the Norse gods at Uppsala around 1090. Robert Ferguson is a sure guide across what he calls the treacherous marches which divide legend from fact in Viking Age history. His long familiarity with the literary culture of Scandinavia - the eddas, the poetry of the skalds and the sagas - is combined with the latest archaeological discoveries and the evidence of picture-stones, runes, ships and objects scattered all over northern Europe, to make the most convincing modern portrait of the Viking Age in any language. 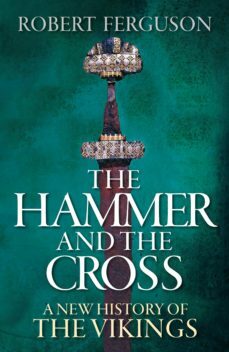 The Hammer and the Cross ranges from Scandinavia itself to Kievan Rus and Byzantium in the east, to Iceland, Greenland and the north American settlements in the west. Beyond its geographical boundaries the book takes us on a journey to a misty region inhabited by Hallfred the Troublesome Poet, Harald Bluetooth, Ragnar Hairy-Breeches, Ivar the Boneless and Eyvind the Plagiarist, in which literature, history and myth dissolve into one another.